We’ve all witnessed how the energy world is changing, and that pace of change is escalating. Compared to only a decade ago, electricity is being generated, distributed, and consumed in very different ways. No matter what kind of facility or business you’re running, the evolving energy landscape presents great opportunities. But to seize them and realize the benefits you need the right infrastructure in place. This series of posts will reveal how power distribution systems are becoming more intelligent and connected to keep up with the new energy paradigm. Let’s start by looking at the underlying drivers behind this evolution. First, energy generation is being increasingly decentralized, in large part due to the emergence of renewables. It’s estimated that by 2030 solar energy and storage will account for an 50% of new global capacity. Beyond large, utility-scale wind and solar projects, large numbers of consumers and businesses are also jumping on the bandwagon to add ‘green’ onsite energy generation. Forming your own microgrid in this way can be, at least partially, a step toward energy self-sufficiency, as well as a source of emergency backup power. Second, environmental concerns continue to encourage the reduction of greenhouse gas (GHG) emissions. Currently, buildings account for 40% of CO2 emissions in the US, while still holding 82% of untapped energy efficiency. And as noted above, renewable energies are becoming mainstream, with solar panels transforming the face of many buildings today. Together, these facts are good cause for optimism. The next trend is digitization. Not only is it touching every aspect of our lives, it’s also impacting the way we run businesses. The transformation to what’s being called ‘smart buildings’ is, fundamentally, about putting intelligent devices throughout a building’s infrastructure to gain more visibility and control. And, finally, electrical consumption continues to grow worldwide. Thankfully, those trends in decentralization, decarbonization, and digitization are going to help manage this increasing demand much better. This requires a new, holistic approach to managing electrical power. Innovative power distribution systems are embedding intelligence throughout the power network. All energy assets, starting from power supply and including the building automation system, are connected and communicating. Premise-based or cloud-hosted software enables real-time ‘edge control’ of the power network, as well as advanced energy analytics. 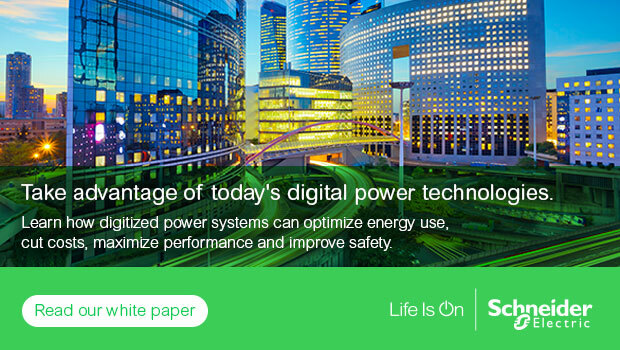 IoT-enabled EcoStruxureTMPower by Schneider Electric is an example of this new breed of solution, unifying aspects of power and energy management into a single, secure, mobile-accessible platform. Such systems can automate decisions and control at the operational level, while helping facility and services teams respond more quickly to potential risks, streamline workflows, and better predict maintenance needs. Analytic applications and enhanced services turn big data into actionable insights, making it easier and faster to reveal potential opportunities, to make decisions, and to improve building performance to extract the greatest value from your infrastructure and energy contracts. In the next post in this series, we’ll take a closer look at the first layer of power distribution innovation: how digitization delivers deep insight.